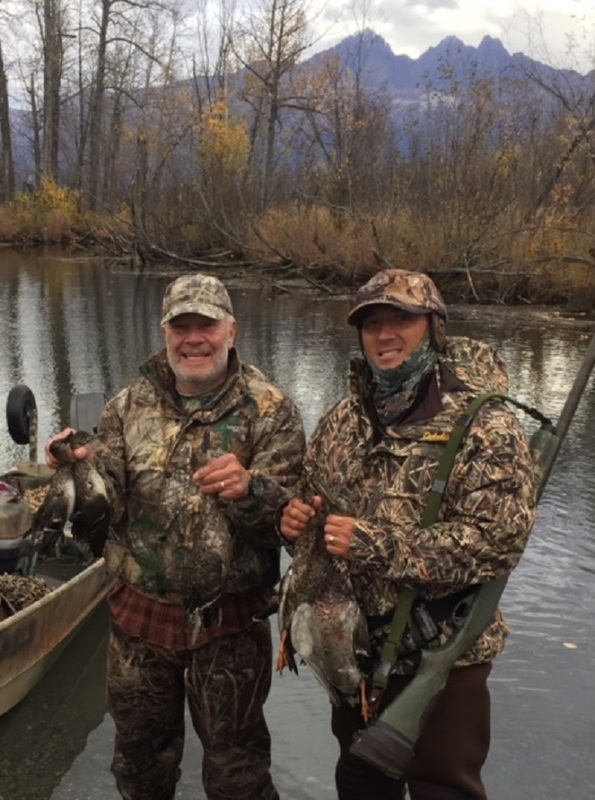 My son, Cody, and I recently went on a duck hunt to Alaska. We flew out of Sacramento, California on October 1st and landed in Anchorage, Alaska, where we rented a car and drove north for 45 minutes to Wasilla, the town where our guide, Mike Robinson, was waiting for us. Posted along the highway were large signs warning of the dangers of moose crossing the road. We actually saw a vehicle off the road that looked like it had been on the losing end of one of those encounters. Pretty close to running into a brick wall. After checking into our motel, we met Mike for dinner at a local eatery to discuss hunting plans for the following day. Mike has been an Alaskan resident for many decades, and in addition to being an excellent hunting guide for waterfowl, he's also an accomplished outboard motor mechanic, photographer, decoy carver, and graphic artist. He would later show us a perfect reproduction of a Ward Brothers vintage pintail decoy he'd carved, and told us the original had sold for $500.000. On the following morning, Mike met us at the motel and we drove to an area known as the Palmer Hay Flats Marsh. We were going to be hunting puddle ducks, not diving ducks. Alaska is well-known for its diving duck population, but we were interested in puddle ducks, and the area we were hunting is a main migration corridor for them. We loaded our gear into Mike's jon boat and headed up Rabbit Slough for a distance of approximately five miles toward the marsh. Along the way, we jumped ducks and saw several moose. The scenery was spectacular, to say the least. The next three days would leave us with memories that will last a lifetime. My son is a police officer in Hawaii, and we can usually get together for a visit only once or twice a year. This trip allowed us to spend plenty of quality time together. When we arrived at the marsh, Mike put us in a platform blind and set out decoys, and then motored to a spot in the rushes where we would have the opportunity to keep birds working between us. 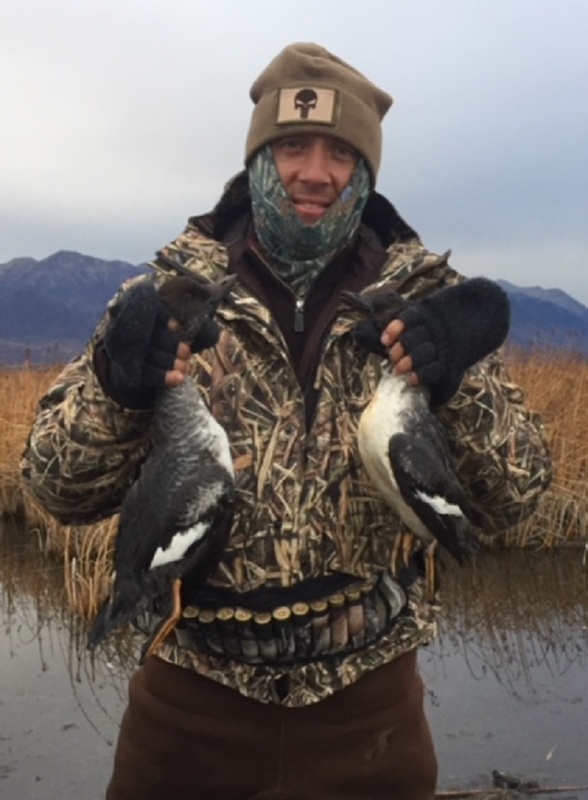 Over the next three days, we bagged a nice variety of ducks, which also included divers such as American Goldeneye and scaup, commonly known as bluebills. Cody was shooting "Old Reliable", a Remington 11-87 that has never jammed or malfunctioned in over 20 years. He made some spectacular shots--amazing, considering he rarely has an opportunity to hunt waterfowl. The bagging of waterfowl turned out to be the least important part of the trip. 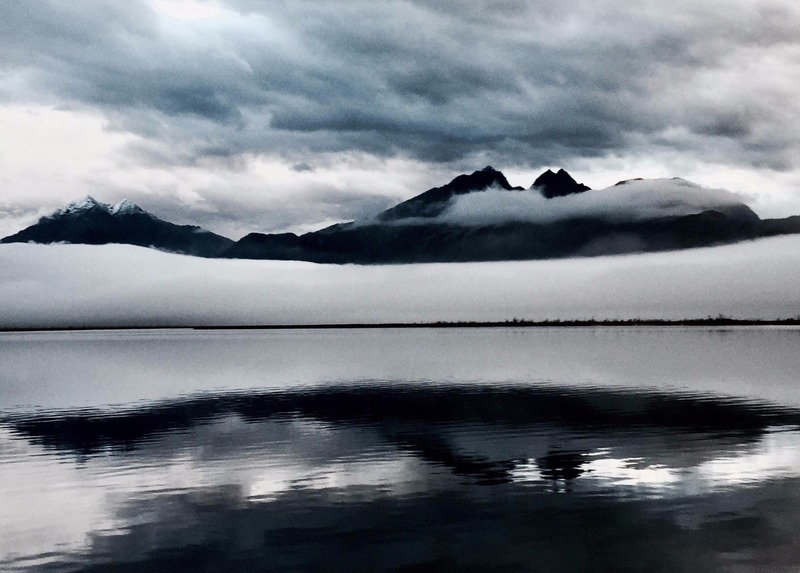 The journey itself, sharing time with Cody, along with meeting Mike (a wonderful man), and taking in the natural beauty of Alaska, were the highlights of the hunt. 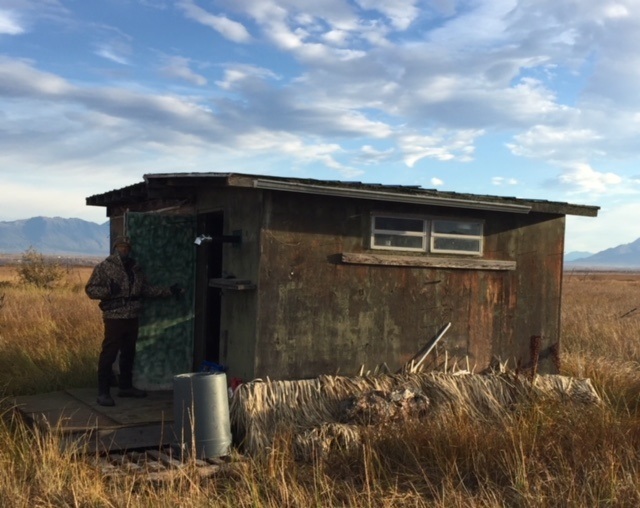 A personal high point for me was when we spent a night out on the marsh in a rustic cabin, which Mike later dubbed DWPD--the Don Webster Pintail Diner. The shack contained a little wood stove, a cooking and dining area, and four crude bunks. Lots of old-school character. I grilled some steak and duck for the guys, and we enjoyed chatting about the day's hunt while we ate dinner. We slept like logs that night, all of us snoring. Cody said I snored more loudly than my own late father, which, if true, is nothing short of phenomenal. My dad could raise the rafters. One interesting observation I made on the trip, thanks to Mike pointing it out, was that the large flocks of puddle ducks tended to congregate in the immediate vicinity of hundreds of swans. The swans would literally turn the water brown and muddy while feeding and it obviously generated plenty of extra feed for the ducks. Find the swans and you found the ducks. On our final evening in Alaska, Mike invited us to his home for a great pot roast dinner. After the meal, he showed us around his place, which included several of his beautiful wildlife paintings, several of his carved decoys, several outboard motors, and photographs. He presented me with a gift, which was a carving of a beautiful, delicate shorebird. My wife loves it. An added bonus: on the flight home, we sat next to a fellow named Curt Olson, who was on his way to Portland and then to North Dakota to hunt pheasants with his grandson. Curt was one of those people whom you feel like you've known all your life after talking with him for about five minutes. He's lived in Homer, Alaska for 52 years, flies a float plane, and has bagged over 30 moose during that time, in addition to elk, sheep, goats, bison, and waterfowl. He shared some great stories during our three hour flight. Quite a guy. P.S. Wasilla is the home of Sarah Palin. Kept an eye out for her, but no luck. 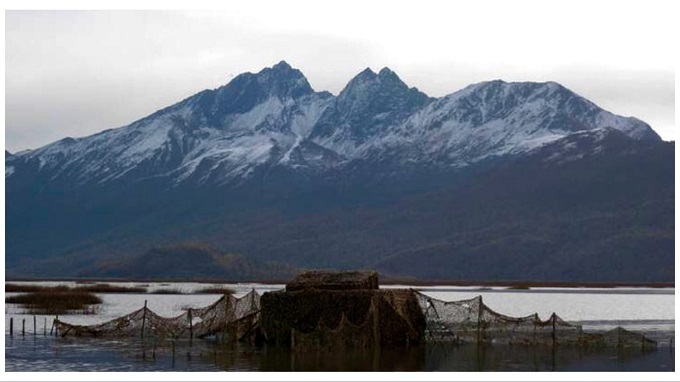 Note: Anyone interested in hunting puddle ducks in Alaska would do well to contact Mike Robinson by phone at (907) 887-6066, email him at akimage@gci.net, and check out his website duckhuntingalaska.com. Don E. Webster has been an avid outdoorsman for over 60 years. In addition to being a columnist for MyOutdoorBuddy.com, Don has published three books: "Bury Me In My Waders" An Old Duck Hunter Recalls His Fowl Past, "Double-Ought Buck" a novel, and "Bears, Beer, Trout Tacos, Etc." Short Outdoor Tales & Other Quasi-Kindred Illuminations. Webster's books can be purchased on Amazon, Kindle, and Barnes & Noble Bookstores. Webster's MyOutdoorBuddy column entitled "Canine Comics" won the Phil Ford Humor Award from the Outdoor Writers Association of California in 2013. Today, Webster's award winning articles and many more can be found on his MyOutdoorBuddy column page, The Outer Edge. You can also follow Don E. Webster on his Author's Facebook! He continues to love fox squirrels and hate eucalyptus trees.